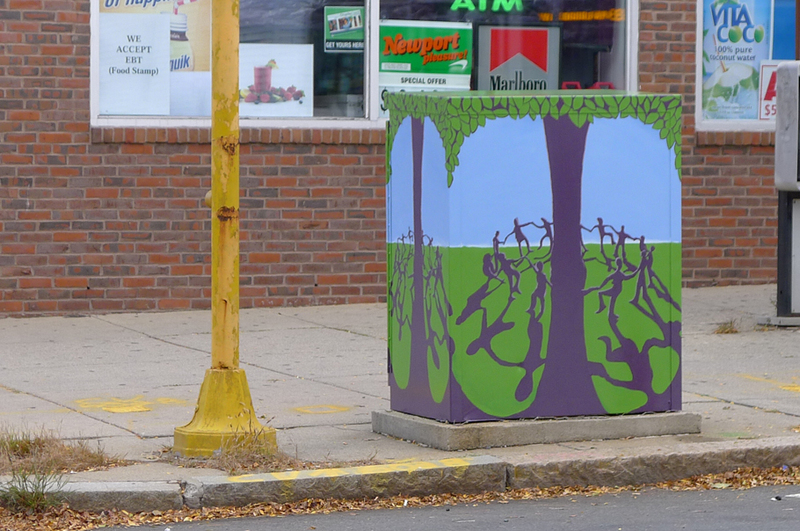 "This switchbox sits in a unique part of West Somerville on the corner of Broadway and North Street near the Massachusetts Bay Veterans Center, the offices of design and architecture firms, the new North Street Playground, and Clarendon Hill Towers. The neighborhood is wonderfully diverse and friendly. I met several people while working on my painting. I wanted my painting to capture a feeling of community through an image of celebration and unity. I chose bright colors to evoke a feeling of joyfulness and whimsy. The image is of silhouetted figures holding hands, dancing around a tree. Their long shadows double as roots for the tree and they are all indistinguishable in gender, age, and ethnicity. Only slight highlights on the forms give an indication of their specific characteristics. I hope that this painting is seen as both decorative and narrative. I like the idea that it can be viewed as an abstract design while also inspiring the imaginations of passers by, inviting contemplation as well as providing visual stimulation."